Hello! Come join us for this 2-wk Healing tour of Ireland’s and Scotland’s incredible Sacred Sites. Most of these sites are from the Neolithic era when people were deeply in touch with cycles of the Earth, and with the Healing process. You are invited to join us in experiencing physical, emotional, and spiritual healing as we gather as a group at each Sacred Site to honor Mother Earth and sing to the lands. 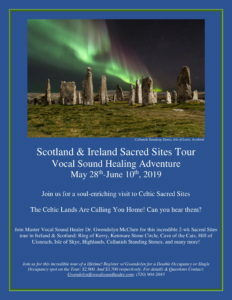 Join us for this incredible lifetime of a journey to explore the winds, breathtaking views, peaceful sheep, stunning Irish Sea and Atlantic Ocean, and hear the Scottish and Irish lands calling you home. To learn more, Contact Gwendolyn via phone or email: (520) 904-2043; Gwendolyn@vocalsoundhealer.com. Double Occupancy 2-wk tour including transportation, hotels, and a Daily full breakfast $2,900; Single Occupancy $3,700.